A selection of exoplanets that orbit in the habitable zone around their stars — where water can sit in liquid form on the surface. 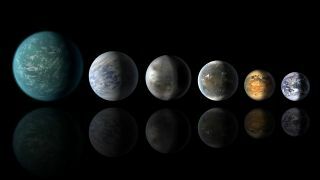 From left: Kepler-22b, Kepler-69c, Kepler-452b, Kepler-62f, Kepler-186f and Earth. Debra Fischer is a professor of astronomy at Yale University and a member of Project Blue's Science and Technology Advisory Committee. She began searching for exoplanets in the mid-1990s, discovering hundreds of exoplanets by measuring Doppler shift and the first multiplanet system. Fischer contributed this article to Space.com's Expert Voices: Op-Ed & Insights. Our search for other Earths has grown at an astonishing pace: The very first planet orbiting another star was found just over 20 years ago, and now more than 3,000 of them draw researchers' eyes. Technology is just reaching the point that we can begin to learn if some of these worlds are like home. It's only recently that we've made some truly exciting discoveries about such distant planetary bodies, called exoplanets. The first exoplanet to be found around a sun-like star was discovered in 1995, just two years before I began studying exoplanet detection. Generally speaking, exoplanets can be any size, and they are found in a wide range of orbits. Some have massive gas atmospheres; others are smaller with an icy or rocky composition. In 1999, my team discovered that the star Upsilon Andromedae was circled by three gas-giant planets — the first distant multiplanet system ever found. That same year, other researchers observed the first "transit" of an exoplanet — a planet blocking out a small fraction of the starlight as it passes in front of the star. Those two discoveries were game changers for the field. Researchers were able to judge the transiting planet's size, showing that it similar to Jupiter. Together with the multi-planet system, this demonstrated that other stars had something in common with our solar system. A decade later, NASA's Kepler space telescope was launched and began to tell us a lot more about exoplanet statistics: Kepler's data showed that the gas giants we'd been finding are actually rarer than seemingly ubiquitous smaller, Earth-size worlds. My colleagues and I are particularly interested in these types of planets, with masses and orbits similar to Earth's, because they'll help us answer one of the biggest questions driving researchers in my field: Are we alone? Over the past 20 years of my career, I've tried to gain a better understanding of the origins of life on Earth and whether we can find life elsewhere in the universe — and, increasingly, I find myself thinking, "We can't be all that there is." However, finding other planets like Earth isn't easy. Kepler revealed a few Earth-like candidates, but those planets are thousands of light-years away, making it currently impossible to detect atmospheres and find characteristics that could denote potential habitability. The technology isn't there quite yet to study these immensely far-off stars, which is why it's worth turning to objects much closer: Alpha Centauri A and B. These are two of the brightest stars in the night sky because they are our nearest neighbors and are similar in age and composition to our own sun. This proximity — 4.37 light-years away — makes them of deep interest to exoplanet hunters. Project Blue's quest to find and photograph another Earth around Alpha Centauri A and B using a small space telescope enters at a unique time in space exploration; both science and technology have matured in such a way that we finally might be able to see our nearest neighbor in a whole new way.